One of the most practical things a student of the organ can write or improvise for themselves is an easy, quiet, peaceful, subdued, and meditative original work in slower tempo which can supplement the communion hymn and be shortened as needed to accommodate a time requirement during a worship service. An example of this type of writing is Communion in E Major Op. 17 (photo). In this communion song we have 2 themes each 16 bars in length which are worked in ternary (ABA) form using repeat bars in all 3 sections. In the opening the 1st theme appears in the tonic key (E) in the soprano line and is harmonized in 4 parts; this section is surrounded by repeat bars with 1st and 2nd endings. Here we find no alto line; instead we find a high tenor voice and low tenor voice moving with the soprano and bass where the low tenor never travels above (middle) C4. This part of the piece is scored for a flute solo in the right hand against a left hand played on a celeste stop. The music then moves to the dominant key (B) where a 2nd theme is presented and worked as a 2 part canon at the octave [See blog, Canon, Parts I, II, III]. Here the left hand line (low tenor) serves as the leader with the right hand line (soprano) following at a distance of 2 bars; the high tenor voice drops out as 2 additional parts (alto and bass) are added to preserve the 4 part texture. This section is also surrounded by repeat bars, with 1st and 2nd endings, and is scored for the Dulciana and Unda Maris. The 3rd and final section begins with a return to the tonic key (E Major); here the 1st theme returns in its own 2 part canon, this time between the outer voices with the soprano line taking the lead and the bass line following, again, at a distance of 2 bars. Two additional middle voices (alto and low tenor) are also written into the music to fill out a 4 voice texture, and this section is also surrounded by repeat bars, with 1st and 2nd endings. This final section is to be taken with the Celeste stop in both hands and is meant to finish very quietly with the box closed. The idea of the repeat bars in all 3 sections is to conserve space in the score (and on the rack) when the composer desires a literal repetition of a passage, and to provide the performer with the means to adjust the music, if needed, to fit a time requirement during a worship service. These repeats are an important part of the structure of the piece however and in a recital situation should be observed in performance, without cuts. Listeners will sense a very peaceful mood settling upon the 2nd and 3rd sections as a result of the inclusion of these 2 part canons at the octave. A short coda of 5 bars rounds out the composition which ends very quietly and peacefully in 5 part harmony with a return of the high tenor voice; quiet stops should be drawn throughout, with the string celeste reserved for the final A section. Students will note that the means used here to create a composition are very simplified, and its composition occupied just 2 days. A communion song requires nothing complicated in terms of key changes and elaborate working, just a memorable, quiet theme having an uplifting, prayerful mood, as in this example. 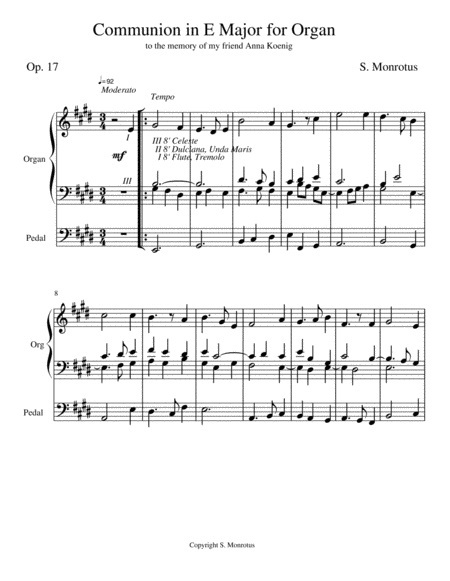 If we can also find a nice canon in that theme, or change it so that a canon can be found, this canon can be worked in 2 parts at the octave with fine effect in a song like this.